Tired of Obama? Would Rather Kill Yourself than Vote for a Republi-Nazi? Well, 2012 is only 2 years away and there is no law that says Obama can’t be challenged in the primary. Posted in Uncategorized. Comments Off on Tired of Obama? Would Rather Kill Yourself than Vote for a Republi-Nazi? Fox News figures have attacked labor unions in the days leading up to Labor Day, a national holiday originally created to honor the victories of the labor movement and the achievements of American workers. Beck: “I think the unions are like Biff,” the bully from Back to the Future. During the September 2 edition of his Fox News show, Glenn Beck said, “You know what I think of some of the unions? I actually think of Back to the Future. I think the unions are like Biff.” Beck showed a clip featuring Biff Tannen, the bully in the film, and added, “But in the end, once you really realize who they are and you’re not afraid anymore, it always turns out exactly the same way for the bully every time.” Beck then showed a clip of Biff working for the man he originally bullied. One can argue, as some have, that Focus on the Family is a fringe group that doesn’t represent the majority of Christians in the United States. That’s true. But it’s also true that Focus on the Family has an outsized impact on conservative thought in this country. And by using deception and spin, the group has managed this week to grab the media spotlight. The goal is apparently to make schools less safe for LGBT students and more safe for their harassers. That cannot be ignored. It’s also impossible to ignore Focus on the Family’s smarmy tactics. Taking a page out of George Orwell, the group has developed a website for parents designed to “challenge the monopoly.” They’ve named it TrueTolerance.org. Sound familiar? Teaching Tolerance has been fighting for children and teachers for 20 years. We can say with certainty that the Focus on the Family campaign has nothing to do with tolerance. And it has nothing to do with keeping children safe. The harassment of LGBT students is rampant and destructive, as has been detailed in the new Teaching Tolerance documentary, Bullied: A School, a Student and a Case that Made History. This film tells the story of Jamie Nabozny, a gay student who was tormented and beaten by bullies while school officials steadfastly looked the other way. Be assured of one thing: Today, thousands of other LGBT students face this same hell just by going to class. Focus on the Family admits that 30 percent of American children report being involved in bullying at school. But all the evidence shows that LGBT students are disproportionately represented in that 30 percent. According to the Gay, Lesbian and Straight Education Network (GLSEN), 86 percent of LGBT students report being bullied – a rate almost three times higher than students in general. The federal government reports that openly gay and lesbian students are at an even higher risk of bias-related violence and physical assaults. Lesbian, gay and bisexual adolescents are more than twice as likely as their straight peers to be depressed and contemplate suicide. More than 60 percent report feeling unsafe at school. LGBT students should be invisible. The group argues, with absolutely no evidence, that generic anti-bullying policies that don’t name LGBT bullying are “most effective.” GLSEN, on the other hand, offers plenty of data to show just the opposite. Schools become safer for everyone when they adopt anti-bullying policies that spell out the categories of students most frequently targeted by bullies—including race, religion, disability, sexual orientation and gender identity or expression. LGBT allies should be silent. Focus on the Family says essentially, “Don’t focus on the victim, focus on the bad behavior of the bully.” But handling each bullying event in isolation ignores the environment in which bullying breeds. Bullying usually begins with name-calling and then escalates. It escalates because too often neither the school staff nor the other students realize that they have a role in stopping it. Bullying thrives amid passive bystanders. School administrators and teachers should be very, very afraid. After terrifying parents that their kindergarteners are soon to be the target of homosexual indoctrination, TrueTolerance.org offers up a menu of deception designed to rally the forces of fear. Parents—armed with misinformation about their taxpayer rights, screwy science about childhood sexuality and bad legal advice—are urged to apply pressure. The group knows that fearful administrators will want to avoid trouble, so teachers will find it harder to stop LGBT harassment. Focus on the Family’s biggest fear is that schools will reflect a diverse U.S. society—one that includes LGBT students. They do not want to be challenged in their belief that homosexuality is immoral, abnormal and changeable. The alternative is to stay silent and stand by while terrible things happen to other people’s children. Terrible things that no parent would ever want to happen to his or her own child. We are glad to stand up for LGBT students and we will not rest until educators across the country do so as well. We are glad to work with groups like GLSEN, PFLAG and Welcoming Schools (a project of the Human Rights Campaign), three of the “gay activist” organizations Focus on the Family is gunning for. And we are proud that they have endorsed the movie “Bullied” as a tool for fighting against anti-gay bigotry. THIS promises to be the worst Labor Day in the memory of most Americans. Organized labor is down to about 7 percent of the private work force. Members of non-organized labor — most of the rest of us — are unemployed, underemployed or underwater. The Labor Department reported on Friday that just 67,000 new private-sector jobs were created in August, while at least 125,000 are needed to keep up with the growth of the potential work force. The national economy isn’t escaping the gravitational pull of the Great Recession. None of the standard booster rockets are working: near-zero short-term interest rates from the Fed, almost record-low borrowing costs in the bond market, a giant stimulus package and tax credits for small businesses that hire the long-term unemployed have all failed to do enough. That’s because the real problem has to do with the structure of the economy, not the business cycle. No booster rocket can work unless consumers are able, at some point, to keep the economy moving on their own. But consumers no longer have the purchasing power to buy the goods and services they produce as workers; for some time now, their means haven’t kept up with what the growing economy could and should have been able to provide them. This crisis began decades ago when a new wave of technology — things like satellite communications, container ships, computers and eventually the Internet — made it cheaper for American employers to use low-wage labor abroad or labor-replacing software here at home than to continue paying the typical worker a middle-class wage. Even though the American economy kept growing, hourly wages flattened. The median male worker earns less today, adjusted for inflation, than he did 30 years ago. This report by Dean Baker supports the case that unemployment is cyclical, not structural. It originally appeared at the Center for Economic and Policy Research. The unemployment rate edged up to 9.6 percent in August as the economy shed 54,000 jobs. The decline was entirely attributable to the loss of 114,000 temporary Census jobs. Excluding these jobs, the economy created 60,000 jobs. With job growth for the prior two months revised up by 123,000, excluding the Census jobs, the August pace is roughly even with June and July. The largest increases in unemployment were among African Americans who saw their overall rate rise 0.8 percentage points to 16.3 percent, near the recession peak. 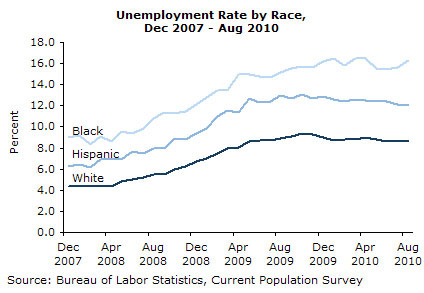 The unemployment rate for black teens jumped 4.8 percentage points to 45.4 percent. Unemployment for Hispanics edged down to 12.0 percent, a full percentage point below its year-ago level. Involuntary part-time employment rose by 344,000, reversing declines in the prior two months. All the duration measures of unemployment fell, but this likely reflected the long-term unemployed dropping out of the workforce as their benefit period ended. The percent of the unemployed attributable to voluntary quits fell 0.3 percentage points to 5.9 percent, which is near its low-point for the downturn.